2017 is likely to be a year of significant change for pharma brands in Europe. With affordability on the agenda for almost every country in the region, a move toward greater collaboration in health technology assessment and more transparency between countries for pricing, therapeutic protocols and details of negotiations with drug manufacturers, the challenges are numerous. We also see member states working to understand the process of enabling cost-effective patient access to personalised and high-cost treatments, such as new oncology combination therapies, antibiotics and stem cell therapies, which offer the promise of efficacy in key disease areas. In this tough environment, it is vital that the requirements for continuing medical innovation and market access are addressed early in the drug development process. Parallel scientific advice from HTA bodies and regulators is increasing to deliver tangible and successful strategies, but is the process smooth enough to overcome the challenges from both sides? pharmaphorum, in partnership with DIA, hosted an expert panel debating the best way forward for life sciences companies, payers and providers in this emerging European market access paradigm. 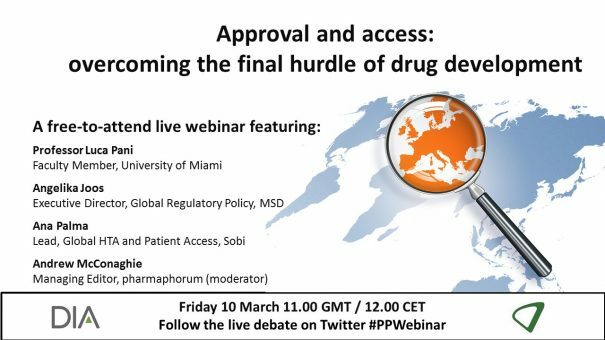 Watch the webinar to hear from experts in industry and healthcare discussing the challenges and solutions of innovation and access in the changing European market. Why are science and innovation important drivers for system change? This event will touch on some of the key topics being explored at the DIA Euromeeting, held in Glasgow in March 2017. The live webinar took place on Friday 10 March at 11.00 GMT / 12.00 CET. To watch the on demand version, please click here or on the button below. Angelika Joos, Executive Director, Global Regulatory Policy, Merck Sharp & Dohme (Europe) Inc.
Angelika is responsible for regulatory policy issues within MSD’s Global Regulatory Affairs and Clinical Safety department since 2001 and currently heads the EU office in Brussels. Over the past 20 years, she has gained strategic as well as operational experience with European regulatory procedures and with various products in different therapeutic areas. Ana is responsible for patient access and public affairs in BeNeLux, including activities related to pricing and reimbursement strategies’ development and implementation. She is a member of the Patient Access & Public Affairs leadership team of Sobi. Ana is also active on various projects at EU level in the context of orphan drugs and rare diseases and where she engages with a broad set of stakeholders including policy-makers, healthcare professionals, government officials, regulators, patient organisations, payers and HTA agencies. Luca Pani is a medical doctor, specialising in psychiatry, pharmacology and molecular biology. He is a Fellow of the National Research Council of Italy and served as Director General of the Italian Medicines Agency (AIFA) from 2011 to 2016. Professor Pani is a member of the Committee for Human Medicine Products (CHMP) and the Scientific Advice Working Party (SAWP) of the European Medicines Agency (EMA). He is affiliated with Department of Psychiatry and Behavioral Sciences at the University School of Medicine.